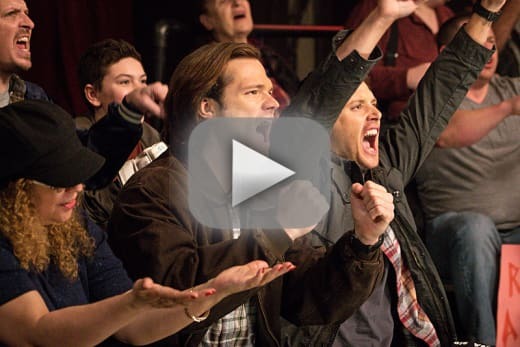 Sam and Dean went to the mat on Supernatural Season 11 Episode 15, and Dean got to fanboy over his wrestling heroes. Plus Lucifer and Crowley got to throw down. So join in the latest Supernatural Round Table. Ding! Ding! Nightsky: Casifer quipped what I thought was the wittiest line this week: “Search every warehouse, every farmhouse, every henhouse, outhouse, and doghouse”. I later found out from one of The Winchester Family Business writers that it was a line from Deputy Marshal Samuel Gerard in the movie The Fugitive. The episode writers get credit for using a great line at exactly the right moment. Christine: I really enjoyed just watching Dean have fun by himself in the wrestling ring. Jensen Ackles must have been having the best time ever just messing around. Sure, he wasn’t able to take out Lucifer (although that sniveling demon minion had it coming), but he got away! Crowley is now a force to be reckoned with. I smell a teamup! 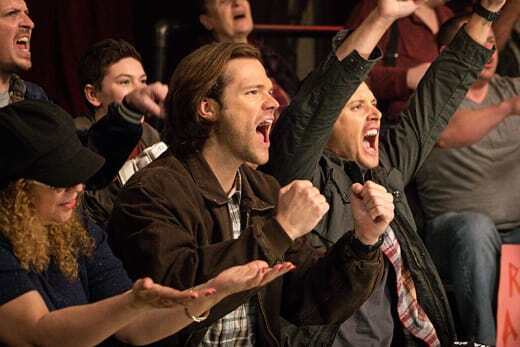 Sean: I really enjoyed Sam and Dean getting to enjoy themselves at the wrestling match. They’ve been in deep with so many problems from the Darkness to Lucifer, that getting them both to have a little fun was a welcome moment. Dean being a fanboy was humorous, but even Sam was having a great time. It was entertaining to watch. Are you as big a wrestling fan as Dean? Nightsky: Not even a little bit. I had to work hard to judge and enjoy the episode on its merits despite being subjected to wrestling! Christine: Not even a little bit. I have little to no interest in wrestling. Alice: I once was. Back in the 1980s when the WWF was big; The Hulk Hogan years. It got old fast, but for a time it provided entertainment. 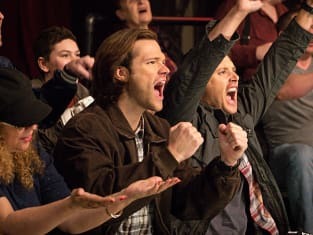 I watched it with my brothers so I could see where it would bring back some good childhood memories for Sam and Dean, especially when they had so few. I see it now though, and I’m not interested. Sean: I appreciate it for the way it entertains, but it’s never been something I’ve followed regularly. But imagine if the Rock showed up for Sam and Dean to face? Now that he's no longer Lucifer's pet, what's next for Crowley? Nightsky: I’m excited by his newfound freedom! Without the burden of Hell’s administration, he can devote all his time to doing what he does best - scheming. I expect him to look for Hand of God weapons (both for his own defense and to keep them away from Lucifer) and eventually reconnect with the brothers for another common enemy alliance. When this is all over, I’m very curious to learn if he’ll want his throne back, though. He was so bored with its routine, and the audience is tired of seeing Hell’s warehouse. It’s a prime opportunity to rewrite his role entirely. I’m hoping this doesn’t lead to him being the sacrificial lamb, though, and leaving the show! Christine: Honestly, I just want Crowley to finally get a good storyline! I think he'll start looking for the weapons on his own. Maybe he'll try and form an alliance with Amara. It'd be nice to see him get some revenge on Lucifer for himself. Whatever it is, I hope that Crowley can go back to being the Crowley we all know and love and not this Crowley shell that we've seen for so long. Alice: Anything but what we’ve been getting recently. No more sitting the lair bored over the bureaucracy please? He needs to kill everyone that was disloyal with the angel blade and work in the field. He needs a leaner operation. He also needs to take the attitude like the demon in this weeks episode, every demon for himself. He’ll defeat all of them because… he’s Crowley. Sean: I think we can all agree that’s it time to get out of the Hell routine with him on the throne. It’s gotten so boring. I just want him to have a good story again and show his presence as the Crowley we know and remember. Lucifer is a super force to be reckoned with, but Crowley isn’t just some demon who will lie down over it. I’m just glad he’s done being the pet dog. Will all of the Hand of God weapons be one and done? Nightsky: Yes, I believe so. No one has said anything that would lead me to believe otherwise. What is curious about them is who can use them. They burn up humans who touch them, but obviously supernatural beings (i.e. Crowley) can use them without consequence. That leads me to believe that either Crowley or Castiel will have to use the weapon in the final showdown with Amara. Christine: I'd assume so. It seems that way, doesn't it? I hadn't really considered the WHO can use them aspect though until Nightsky just brought it up. That IS interesting. Maybe Castiel will be the one who ultimately uses it and THAT's how he'll get his groove back? Alice: I don’t understand what’s happening with that. Are these all things God has touched? What if Chuck is God (which I think he is)? Does this mean the keyboard he touched, or the robe he wore can be Hand of God weapons? Did he leave these artifacts on purpose? Finding them looks like a huge task, and I think Crowley is the only one that knows where to look. Lucifer is going to be kicking himself for letting him get away. In answer to your question, probably. That does seem to be the established lore, unless the chosen mortal (probably Dean) touches one and doesn’t implode. Then he might get more mileage out of one. Sean: I kind of like the one-and-done weapon, that way it has to be used strategically. But yeah, who can use them is interesting. I mean, we all probably would assume Sam or Dean would use it against Amara, but what if it’s Castiel or Crowley or, wait, did anyone think about Death using it in his triumphant return? Anything you'd really like to see in the final episodes of Supernatural Season 11? Nightsky: Wow. That’s a good question. I want the brothers to continue their honesty and brotherly love. I do not want either of them to end up in the void (although I believe that is a distinct possibility). I would like Castiel to learn he is valuable. And I would like Crowley’s role to be revitalized (although I enjoy him more as a scheming ally than a simply evil demon). Is that too much to ask? Christine: I definitely want the brother bond to stay strong. I want to see Sam continue to be the strong one throughout the rest of the season, as it's really felt, to me, like the season of Sam. And I'd love it if the season ended and no one died or got sucked into hell or purgatory. And, of course, I still want to see Chuck show up. Alice: Honestly, a story that makes sense and manages to surprise me. Also, episodes that pick up the pace a bit and generate a least a little excitement. The last couple of seasons seem to run out of gas as they progressed to the end. Just keep the ball rolling, don’t give us crap like the Frankensteins, no meaningless deaths, and we should be fine. Sean: I’ve really enjoyed this season for the most part, and I’m looking forward to where things wind up as we head to the end. I’d love to see God whether that be Chuck or someone else entirely, at least in some capacity. And I agree about keeping the Sam and Dean bond strong. A few surprises would be nice, but I just hope that as we hit that ending, there’s a good feeling about the direction of the story.